Before you even take a bite of this beet salad you’ll be impressed. Just the colors alone make it wonderful. The paper thin sliced beets, walnuts, cheese and arugula create a flavor combination that works in spades. 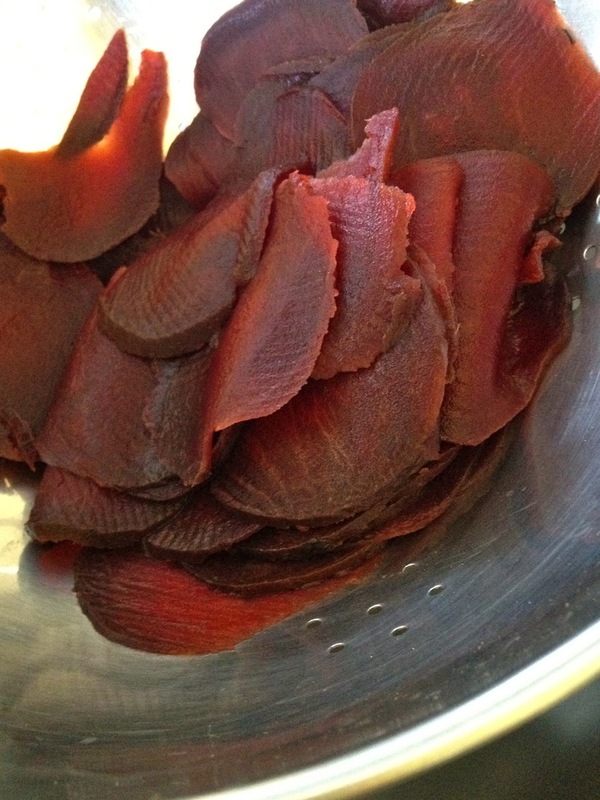 Slice the beets paper thin and drain thoroughly. I suggest using a mandolin. Arrange the beets circularly in a fan shape on an individual platter. Top the beets with dollops of cheese and toasted walnuts. Top the salad with arugula. Lightly salt the salad and drizzle with extra virgin olive oil. Sometimes the simplest ingredients that can be put together in two seconds produce some of the most amazing results! We were all impressed and looking forward to the second act (our pasta) but alas great beginnings don’t always lead to great ends. Try the salad though. With summer at our fingertips it’ll be a great addition to any summer meal repertoire. Add a crusty Italian hearth loaf and a crisp, chilled white wine and your meal is complete!